3/21/2011 - This is clearly a Lightning Dragon (or Storm Dragon). I originally gave it a lightning-bolt-on-attack trigger but, yeah, that's sort of been done. What other lightning effects can we reference? Chain Lightning? Close... but terrible. How about this? That's a bit wordy for a red card, but basically, whenever it deals damage, that damage arcs around until the energy is spent. I was originally going to give this Dragon 3 power so it could start at bolt level, but the card was clearly uncommon and a three power red flyer with upside would need to cost 5cc at a minimum. Fortunately, borrowing the stats from Dragon Whelp balanced it very reasonably and, I would argue, makes the dream of pumping it for crazy damage much more exciting. I'm not 100% sure it can trigger itself multiple times, but I believe so. Fortunately, it makes no difference in the unpumped form and is only a matter of being Very Good or Awesome after being embiggened. Where to begin? You've got a triggered ability that triggers itself. It uses the ugly phrase "that much damage minus one", and ends with "it hasn't already dealt damage to this turn". 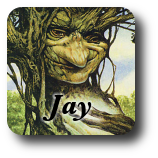 Most players are going to take several tries to comprehend what this card does. Also, the name "Lightning Dragon" was already used in Urza's Saga. It was even that set's prerelease card, which made it the very first foil card. And and and! It's just really unbecoming of an adult dragon to have less than 4 power. Heh. Now I want to sneak in a test CCDD in which I insert as many subtle errors as possible to see if you guys can find them all. While it's really messy, I like the idea. However, I'd give it 0 power and firebreathing. This is an absolutely brilliant idea and I love it, BUT! It should be a mythic rare. The idea that it just smashes with this countdown chain lightning is superb. It needs retemplating, but I sincerely think the resonant flavour of this is worth trying to make it work. Outstanding. I like the self-triggering. Maybe "Whenever Blitz Dragon deals damage, you may have it deal X damage to target creature or player it hasn’t already dealt damage to this turn, where X is the amount of damage dealt minus one." I do like the idea though. Basic concept is great, but I'm not sure where "it's clearly uncommon" comes from. 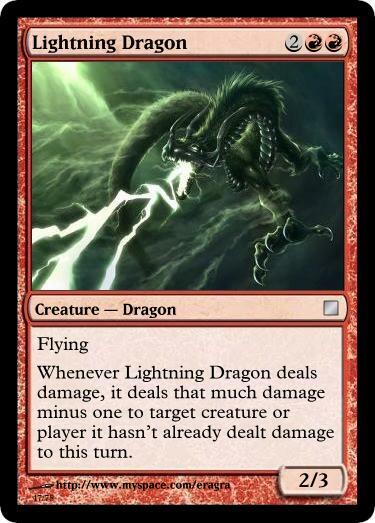 A dragon, which generates arcs of lightning that bounce around the board and are limited only by the amount of damage you can initially generate? That screams rare, or even mythic. Even more if you can tack on an appropriately overcosted firebreathing ability, like Mordant Dragon on crack.